Currently, more than 500 million single-use plastic straws are used and thrown away every day in the U.S. as Americans use them at a rate of 1.6 straws per person per day. As a natural substitute material for plastic aluminum is lightweight and environmentally safe. That adds up to a staggering 175 billion plastic straws per year, with many of them finding their way into landfills, waterways and oceans. A recent National Geographic report highlighted the impact of plastics on marine wildlife, revealing that more than100,000 marine animals, including sea turtles, die each year as the result of plastics making their way into the oceans. According to the Network for Sea Turtles (N.E.S.T. ), plastic straws are the second most commonly ingested plastic item found in turtles. Since the passageways for food and air in a turtle are connected much like they are in humans, the threat to turtles is especially serious. On a recent trip to Key West, William Marshall, co-owner of LizBets, and a long-time manufacturing veteran, was presented with the issue first hand. While there, he met with Ralph Capone, president of The Key West Sea Turtle Club, who made clear to him the scope and gravity of the plastic straw problem. Capone explained that the situation is approaching epidemic proportions with some species of sea turtles facing virtual extinction. That night, Marshall began researching the issue, and drew on his years of manufacturing experience to reach a possible solution. Already quite familiar with the aluminum extrusion manufacturing process, he was well versed in the properties and benefits of aluminum. Marshall wondered, ‘Why not substitute aluminum as a reusable alternative to the plastic straw?’ The very next day, Marshall met with Capone to share his idea, and the Sea-Straw was born. 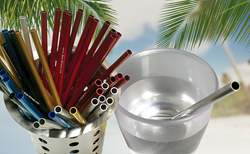 In achieving a desired color, the aluminum straws go through an organic dye coloring process that involves 100% organic dyes, which are National Sanitation Foundation (NSF) certified and metal-free. Completely organic and environmentally safe, the process is also American National Standards Institute (ANSI) 51 certified, indicating safe usage for food application without any heavy metals. LizBets anticipates opportunities for aluminum straws in restaurants, bars, colleges, hospitals, as well as corporations. They have already had conversations with a number of major cruise lines, resorts, spas and several major hotel chains. For promotional and branded use, aluminum straws can be etched with a brand’s name, presenting unique marketing opportunities that carry with them additional impressions of environmental responsibility and wildlife stewardship. Some other possibilities for use and customization include corporate events, conventions and conferences, and even weddings. In August, LizBets will be on hand during the Western Foodservice & Hospitality Expo August 19-21 at the Los Angeles Coliseum, where attendees will be introduced to the eco-friendly aluminum straws, and have an opportunity to learn more about the plastic straw crisis and its adverse effects on the environment and marine wildlife. Minalex Corporation, located in Whitehouse Station, NJ, has been a family owned business since it was founded more than 50 years ago. An industry leader, the company manufactures small profile aluminum extrusions with precise tolerances, specializing and excelling at producing the most custom solutions. As a full-service organization, it provides finished, high quality products, both standard and custom, that conforms exactly to customer specifications. Minalex Corporation is a fully AS9100 and ISO9001 certified company with AMS Specs, MIL Spec and QQ Specs. For more information about Minalex Corporation, please visit: http://www.minalex.com. Headquartered in Poughquag, NY, LizBets Inc., a woman and veteran owned small business, is the developer and producer of the aluminum Sea-Straw, a new, 100% American made solution designed to protect oceans, marine life and reefs, while elevating consumers’ beverage drinking experience. For more information, please visit http://www.sea-straw.com.